^ According to Knuckles' Character Profile, Knuckles "guards the Master Emerald which powered up the Chaos Emeralds." ^ The character depicted in the text is named 'Super Tails'. 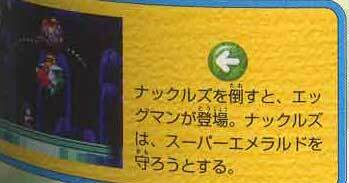 ^The caption reads, "After defeating Knuckles, Eggman appears! Knuckles tries to protect the Super Emerald.."